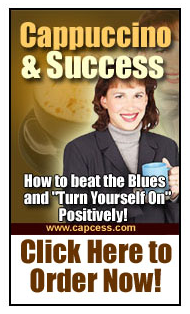 ​How to beat the Blues and "Turn Yourself On" Positively! ​How much is Success and your Personal Achievement worth to you? Suppose you could just read a few short inspirational and motivational stories to inspire you to take the steps and action to change...to get you out of your comfort zone! Well, it isn't if you have the right inspirational and motivational stories to inspire and move you to take the necessary action to change. The success principles and inspirational quotes behind these stories are so powerful that it can lead you to a stress free life. Think about it. These short inspirational and motivational stories have been carefully selected to inspire, motivate and lead you to health, wealth and happiness. If you are looking for a book that is easy reading but can have a profound impact on your life, this is the most important message that you will ever read. 101 Short Stories to beat the blues and "Turn You On" Positively! ​Provide you with proven Success Principles that are simple, inspirational and motivational to help you to achieve better results in your relationship, work, and business. When you feel down, and discouraged, this motivational book will help to Inspire and Motivate you. Provide you with inspirational and motivational thoughts. Your inspirational reading of this motivational book will make you appreciate your loved ones and have a better lasting relationship. ​If you desire more out of life.....keep on reading. SPEAKERS & TRAINERS who need simple stories with success principles to spice up their already fantastic presentation. CHILDREN who love bedtime stories. Give them enjoyable short stories with success principles to mould their mindset. TEENAGERS to give them motivational reading materials to create a purpose and success orientated generation. PARENTS who need inspirational and motivational stories to keep on believing in themselves & their children as they raise them in a less than perfect environment. EVERYONE who needs daily inspirational boost as they pursue their ideals & dreams. And to keep their hopes alive as they face the everyday challenges in the real world. ​"I have absolutely LOVED your book. I do a lot of public speaking and use the stories quite a bit. If there is even another book like it please let me know." ​Thank you very much for this incredible book! I can only compare it with the famous "Chicken Soup for the Soul". "Cappuccino and Success" is instead a chicken soup for the Mind - it is not only motivational, it is constructive and helps find things that hold us back. ​The only comment is AWESOME!!! Almost every stories, I am enlighten by the Success Principles. I did learn a lot from them. Thank you so much for your sharing. WELL DONE!!! 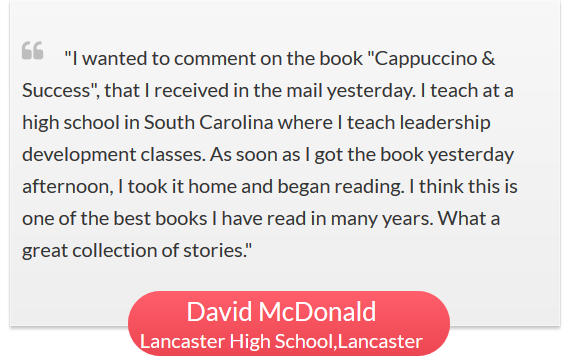 ​Though I'm not a cappuccino fan, I really enjoyed reading Cappuccino & Success. The stories and the success principles gave me new distinctions and better perspective to help me reach closer to my relationships, business and spiritual goals. ​"Richard, your "Cappuccino & Success" is great. You have put together an excellent collection of stories and have added a well though out success principle to each story. My family and I are reading one or two stories out loud each evening when we read our scriptures. The children are not taught principles like this in school, so it is good to be able to use your book to help teach some sound principles. Thanks a lot for the newsletters and the inspiring stories you've sent me...It really helped me in having a more positive outlook about life and in dealing with everyday situations that really helped me developed my attitudes in a more mature perspective...I will always be thankful to you in this kind of way for the success that I may reap in the near future. Have a nice day and God bless you always! I hope you, your family and your staffs are well right now. Thanks for all the stories you've sent to me. It was all really inspiring. It made me a little richer every day, coz I am a believer of Jim Rohn's famous quote: Success is not what you have but what you become. And you are enriching my mind a little wiser and heart a little tougher in order to pursue my dreams with every story you sent. Once again, thank you very much.. I am still with you. This is to thank you for your inspirational stories, they do help a lot and it is to also let you you that I forward every single story you send me on to my friends. I appreciate and love the "CAPPUCCINO & SUCCESS" stories. Please keep up the good work. First of all I want to thank you for taking the time to send me the inspirational stories. They are wonderful! I started reading the stories at work and then I decided to get them sent to my email add. They are very helpful. I just wish they would come more often. I save them and read them over and over again. Thank you very much, they are greatly appreciated and I look forward to hearing from you again. This is Kaval from India. Its really very nice to read such inspirational stories & the hidden meaning behind it. From this frustrating life where everything goes wrong your mails of short stories really helps to see the other side of things. Plz keep me sending such mails & I will be waiting for that every week. Greetings of Peace & Joy. Indeed I enjoy your cappuccino stories . In fact I already used your stories for my sermons . They are more of practical and realistic in nature. More about it I will write later. As Christmas is fast approaching I wish that may God grant you a long and healthy life. How are you ? hope you are keeping well. What has Cappuccino got to do with success? 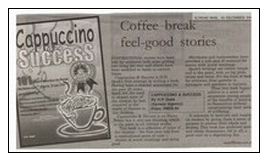 Cappuccino & Success is a simple book with 101 short motivational stories for everyone. I chose the name "Cappuccino & Success" because I am like one of those millions of people around the world who enjoy a cup of cappuccino. Cappuccino lovers will not let a day pass by without having a cup of that delicious concoction. So just like being "addicted" to cappuccino, in order to have success, we have to be "addicted" to success and desire it everyday. As we go through our daily life we meet with all kinds of obstacles and challenges that may cause our spirit to be low and get us discouraged. We need to recharge ourselves everyday. Each story is like a cup of cappuccino to inspire, motivate, and rekindle our spirit and mind towards the goals and dreams that are before us. The 101 short stories are a compilation of real life and fictional stories to illustrate the success principles of life. It is my wish that this book will help to inspire you and rekindle your spirit through some of the stories. Success is a progressive realization of a worthwhile ideal. Success is a journey and not a destination and I wish you an enjoyable journey and meaning in your life. Richard Quek is a Chartered Accountant by profession having more than 20 years of experience as a practicing accountant. He is an Associate member of the Institute of Chartered Accountants in England & Wales and a Member of the Malaysian Institute of ​ Chartered Accountants in England & Wales and a Member of the Malaysian Institute of Accountants. In his years of experience he has gained management and communication skills, having to deal with personnel, clients and government officials of various levels and categories. ​​He has served as President of the Lions Club of a district, and held numerous other positions in other non-profitable organizations. He has also trained and motivated many entrepreneurs to be successful. His main areas of interest are Goal Setting, Leadership Training, Communication Skills, Success Attitudes and Team Building. He is also the author of more than 10 books. 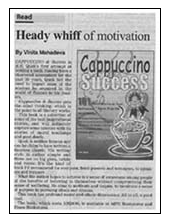 WHY "Cappuccino & Success" is different from other motivational and inspirational books? 1. 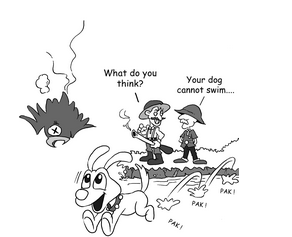 The book is Easy reading - even a child and non-reader will love the interesting and meaningful stories. 2. The stories are comprehensive and simple to read. It convey to readers about the realities of life and how to overcome obstacles. 3. The stories are FUN and INTERESTING to read. Some of the stories will make you laugh while others may make you cry. The stories will touch you emotionally. 4. The stories are either fictional or real life stories of successful people everyone knows - Colonel Sanders of KFC, Fred Smith of Federal Express, Thomas Edison, and Christopher Columbus, to name a few. ​5. You can share the stories and success principles with your children. They will love it!! 6. Where else can you get a compilation of such life changing stories for only 19 cents each? The following are two "cappuccino" stories for your reading pleasure. There was once a King who had a wise advisor. The advisor followed the King everywhere, and his favorite advice was, “Everything happens for the good”. One day the King went hunting and had a little accident. He shot an arrow at his own foot and was injured. He asked the advisor what he thought about the accident, to which the advisor replied, “Everything happens for the good”. 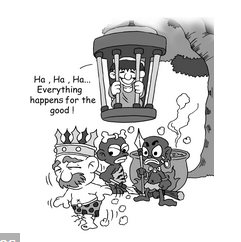 This time the King was really upset and ordered for his advisor to be put in prison. The King asked his advisor, “Now, what do you think?” The advisor again replied, “Everything happens for the good”. So the advisor remained in prison. ​The King later went on a hunting trip, this time without the advisor. The King was then captured by some cannibals. He was taken to the cannibals' camp where he was to be the evening meal for the cannibals. Before putting him into the cooking pot he was thoroughly inspected. The cannibals saw the wound on the King’s foot and decided to throw him back into the jungle. According to the cannibals' tradition, they would not eat anything that was imperfect. As a result the King was spared. The King suddenly realized what his advisor said was true. The advisor also escaped death because had he not been in prison, he would have followed the King on the hunting trip, and would have ended up in the cooking pot. It is true that everything in life happens for a purpose, and always for our own good. If you think about it, all our past experiences actually happened to bring us to where we are today, and it is always for the good. All the past experiences makes us a better person. So, whatever challenges that we may face today, consider it happening to bring us to the next level. ​Okay, so what's the cost of this incredible ebook? How much are you willing to invest if you could have the information that could inspire and motivate you to take the action to change? I could sell this precious and valuable information for US$47.00. But I'm not going to charge you anywhere near that amount or even my minimum project price. In fact, your total investment for the 'Cappuccino & Success' ebook is ONLY US$19.95. This is a one time payment and there is no hidden cost involved. This is indeed a bargain considering that you are going to be in the 5% category of achievers after reading and implementing the information in this ebook. ​You have nothing to lose by placing your order through our secured server. 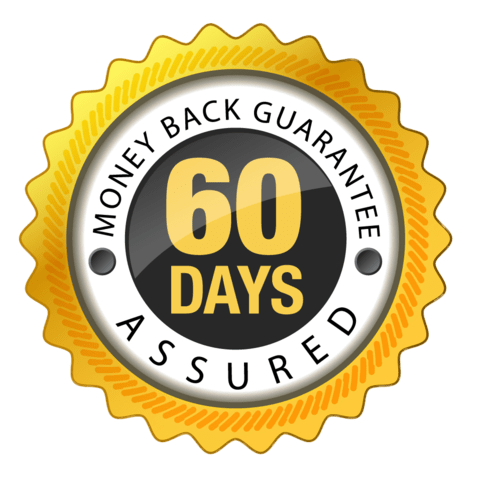 I am confident that you will find every part of the book useful that I am willing to provide you with my 'iron clad' 60 days 100% unconditional money back guarantee. Let me be the one to take the risk...You have nothing to lose. Should you find Cappuccino and Success not to your expectation, I do not want your money! Just let me know and I'll arrange for an immediate 100% Refund. Born Rich ebook : This is a best seller by Bob Proctor which will reveal to you that you have vast potential within you. As a Man Thinketh ebook: This is an all time classic by James Allan. Goal Realization Made Easy: How To Easily Achieve All Your Seemingly Unreachable Goals and Experience the True Happiness You've Always Longed For, No Matter How Disoriented You May Be Today! Speak Out: A Guide To Making Impressive Speeches: Discover how you can be an effective speaker. Goals Magic System Work Sheets. Step-by-step guide to setting your goals and achieving your dreams. That's not all... I will also include an additional FREE Bonus # 7 which you will not be able to get anywhere else in the market : Complimentary eBook "Cappuccino & Success" - 10 short stories with success principles! If you ORDER TODAY, you'll receive the 7 Bonuses absolutely FREE. This offer is only valid for a limited period of time. 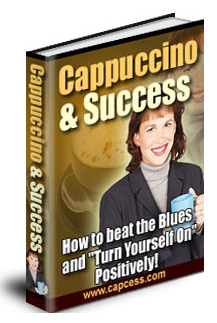 Get 'Cappuccino & Success' now and start your journey to a more successful life that you rightly deserve! Don't wait.....You get a 60 days No-Risk Unconditional Money Back Guarantee and all the 7 Bonuses absolutely FREE if you order NOW!! You get to keep the 7 Bonuses as a compliment from us. To take advantage of this Special Offer you need to order NOW! Remember that you can read the ebook to try out the success principles and if you find that it is not worth the US$19.95, just let me know within 60 days and I will personally arrange for a 100% refund without any questions asked. You have nothing to lose! The only thing that can happen is that you will discover the ways to get out of your comfort zone. ​That means you can try out all the success principles and techniques revealed in the ebook at my risk, while you see if they work for you or not. And if they don't produce, I honestly want you to ask for your money back. And I'll let you keep the free bonus gifts as my way of thanking you for giving ‘Cappuccino & Success’ a try. There is absolutely no risk, whatsoever on your part. The burden to deliver is entirely on me. If you don't produce the desired result using the information in this ebook then I'm the loser, not you. 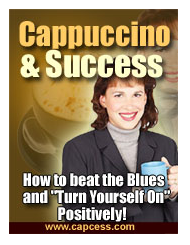 You really can't afford not to invest in 'Cappuccino & Success'. Get ready to Change your Life - ' A Cappuccino a Day keeps the Negative away! YES! I would like immediate access to the 'Cappuccino & Success' ebook, so that I can learn how to apply the principles of success to my life. I understand that I'll receive the ebook in the PDF format within the next 5 minutes. I also understand that I am entitled to the promotional price of US$19.95 and that my purchase is subject to a 60 days 100% Unconditional Money Back Guarantee. ​I know that you are a man of wisdom and will make the right decision! Thanks for your precious time and may I take this opportunity to wish you meaning in your life. ​P.S. You can have the eBook within the next 5 minutes, and start making serious changes for your future. Just imagine...You can have access to all the 101 motivational stories for ONLY 19 cents per "Cappuccino" story. P.P.S. You only pay US$19.95 for the eBook and you have our 'Iron Clad' 60 Days 100% Money Back Guarantee. P.P.P.S. You get to keep the 7 FREE Bonuses valued at US$109.70 even if you decide that this eBook is not what you expected. P.P.P.P.S Remember!! Change can happen in an instant .......it is the decision to change that takes a long time. Click here to order online now.